It wasn’t too long ago that the future looked bleak for pickup trucks that were a little undersized. All three American-branded companies had said goodbye to the quarter horse-sized residents in their stables as they concentrated on more Clydesdale-proportioned versions. Only a few offshore-named samples remained. The idea seemed to be that U.S. buyers didn’t want to downsize. Workhorses (aka work trucks) needed the grunt to do their job. And anyone who bought one still could have all the lux, hi tech amenities and panache found on most luxury cars if they wanted to upgrade. Ford no longer gives sales numbers monthly, but indicates orders for the Ranger are “flying” out of the showrooms, off the lots, off the shelf so to speak (use your own similitude) since it went on sale in January. 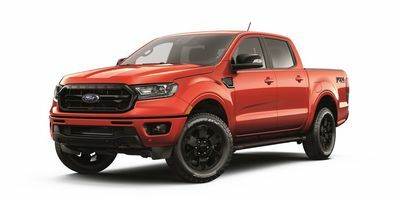 If anyone doubted it would be a statement vehicle, Ford's report that two-thirds of the orders in its first few months include Ford’s bold Sport or Chrome Appearance packages is a pretty good indication. The new appearance package ($1,995 and available for delivery by early summer) includes some aggressive focal points, a black grille, running boards and accented wheels among them designed to make such body colors and body color bumpers as Pepper Red and Lightening Blue – or any other body color – “pop,” according to Ford. 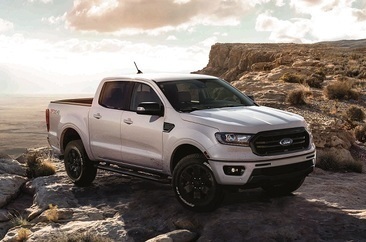 That also confirms that the Ranger is, in Ford terms, an “adventure” vehicle. 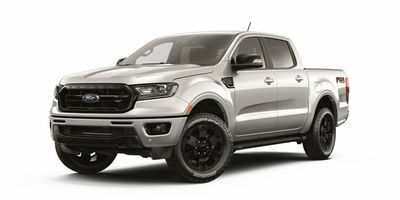 Adding the bold and bad attitude includes such trim features as high-gloss black-painted 18-inch aluminum wheels with black center caps, black running boards, mirrors, sill plate and black bash plate on the FX4 Off-Road Package. There’s also a black lower valance and spray-in bed liner. And when you have the moxie to add more badass visuals to the off-road 2.3-liter EcoBoost engine, four-wheel drive mode, and 10-speed automatic, that’s pretty much a guarantee this adventure vehicle is looking for its next venture. Oh, and way back when, the story goes, Ford founder Henry Ford would only sell a vehicle if it was painted black. Seems he was way ahead of the curve. The new Black Appearance Package gives Ranger customers another option – $1,995(plus tax) – and can be ordered at dealers now, with deliveries targeted to begin in early summer.